Giveaway #2 is super exciting because I partnered with one of my all time favorite skincare brands! fresh!! Oh yeahhhh. Before I get into this giveaway let’s announce last weeks winner who gets a brand new Urban Decay Naked Petite Heat Palette! Drum Roll please… CONGRATS to DESIREE MACIAS! I will contact you by email to so I can get that sent to you ASAP and thanks to everyone who entered! SO NOWWWW it’s time for this giveaway and for this one there will be 3 winners!! So you have a really high chance of winning this one. 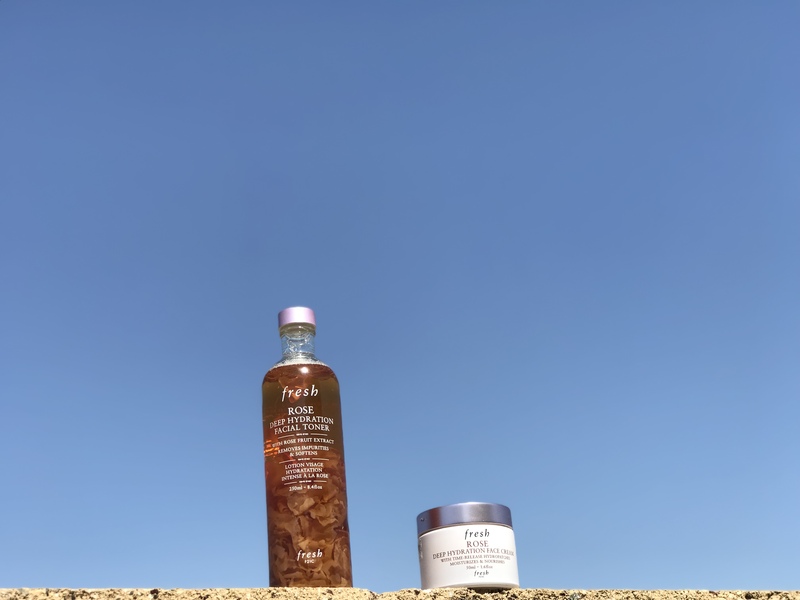 fresh is giving 3 winners a Rose Deep Hydration Face Cream and A Rose Deep Hydration Toner (VALUED AT $84)!! psst…I did a little skincare routine using fresh products as well in a video for you at the end of this post. So, what is the big deal with the fresh Rose deep hydration face cream and Rose Deep hydration facial toner you ask? Well let me tell you. The first thing you probably notice about the toner is the actual package itself right?! I mean it has real rose pedals for crying out loud! How pretty is that. I like to leave mine out on my bathroom sink because it just looks like beautiful decor. So for those of you who aren’t familiar with toner. Toner is actually something I highly recommend in your skin care routine. Toner helps fight traces of dirt , oil, and stubborn makeup that may have been left behind. Basically a extra cleanser for your skin after already using your original cleanser. You can use a cotton pad or your fingertips (Like me) to gently sweep on your face and it’s going to hydrate your skin and refines the appearance of pores making your skin look super healthy. This toner is gentle enough to wear twice a day in the morning and at night. I use face cream MORNING and NIGHT. If you don’t want dry and flakey skin then you need to use moisturizer. I was always told in my teens to wear sunblock and moisturizer and I did just that. It’s really important for your skin. fresh Rose deep hydration face cream has a beautiful scent of rose to it but not overwhelming where it makes you light headed haha. This one also delivers intense 24-hour hydration for dry skin. Hyaluronic acid attracts moisture. Since using this specific moisturizer I have noticed my skin looking more awake, brighter and just overall more vibrant immediately after use. I also want to add I have combination skin. My T Zone is extremely oily but this doesn’t leave it shinier after applying unlike some other moisturizers I have used. I end up looking like sweat central on the T zone. Yikes! So thank goodness for this one. You can actually see for yourself in the video posted below. Rule # 2: Comment here on my blog post what color top you are wearing 😉 and your IG name. Easy peasy. 3 winners will be chosen on April 25th!! GOOD LUCK!!! Today I am wearing purple and my IG is @randi_spiegel. I am wearing a black and white top! IG is aprincess50. How fun!